This was the first conditioner I used when I started taking an interest in ingredients and the effect on my hair. All the natural ladies seemed to be raving about it on the blogs and forums I had read in the course of my research, so I decided to give it a try. It has 100% natural ingredients and contains no protein, which is great for the protein sensitive. It also has no humectants, which makes it suitable for drier climates (note to anyone living in the North, or those who make regular trips to more wintry climes). And the best feature, for me anyway, is that it smells great! 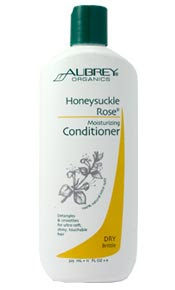 After the 30-something years of prior abuse I had put my hair through, Aubrey Organics Honeysuckle Rose Moisturising Conditioner (or AOHSR, as it is known in hair-world) was definitely the best product to have ever come in contact with my parched barnet! I noticed a huge difference even after the first use. It felt like a completely new head of hair after rinsing. I had just taken out braids, and the dry brittle locks seemed to have been instantly replaced with softer strands with improved elasticity. A true product junkie, I experiment a lot, trying out different conditioners- which I will review in due course- but I always come back to AOHSR. It is definitely the best deep conditioner my hair has ever met. It keeps my hair moisturized without ever getting that greasy product build-up feel, and I don’t have to be too heavy-handed with the moisturizers during the week to keep it that way. It has a very thick consistency (so thick that I sometimes find it hard to get the last bit out of the bottom of the bottle without pouring some water in and shaking it up), so I have never tried to use it as a leave-in, although some people do. This, however, would be most effective if mixed with a lighter conditioner or diluted. The only con is, due to its consistency, it’s not a great detangler. The two ways to get around it are to detangle with a more slippery conditioner first, usually whatever cowash conditioner I have used, and then apply the AOHSR. Or I find that the addition of Olive oil gives more slip, and makes it easier to run a comb through. All things being equal, I don’t think I could ever give up this conditioner!